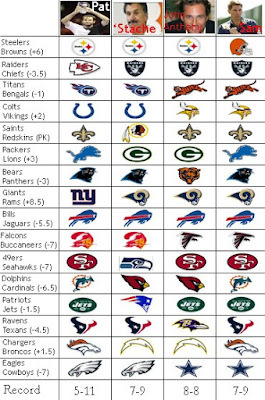 Here is the picks table for this week. New improvements to this week's table is the use of resumè-approved Garamond font in the results row. You never know who could be watching. Everyone is picking the Steelers, which is never a good thing. Plus, this line places too much emphasis on the first week. Giving six points to the team that is supposed to challenge for your division title in their house? Too high for my taste. Steelers win, but it won't be as easy as most think. Both of these teams were supreme disappointments in Week 1. I'll take the dog early in the season. Going with the theme of overvaluing of Week 1 results, I think too many people will be low on the Bengals. Look for their offense to spark back to life. The Colts lost to a team last week that pounded the ball and played good defense. Sound familiar? Peyton needs another week to fully get into the swing of things. Going against my own warnings about premature predictions from one week of football, I feel comfortable making this statement: Jim Zorn is the worst coach in the NFL. I like the Packers this year and really like Rodgers. Which is why the Lions pull this one out. Two teams who had equally impressive wins last week, but are probably playing over their heads. The deciding factor in this game? Dan Connor. The Giants aren't that good and the Rams aren't that bad. Paul Posluszny is going to the Probowl this year, just watch. This one is screaming for an easy Bucs victory after Atlanta played well above their potential last week. But the +7 was just too palatable to pass up. Favoring anyone in this division by more than 3 points is insane. This pick is based more out of desire to enjoy a Patriots loss than anything else. I'm looking forward to the elation that was felt during the Patriots loss in the Super Bowl to be spread out over 15 games this season. A nice slow burn. How the Texans could give 1.5 points after last week's loss combined with the Ravens win is beyond me. Still, Flacco is a one week wonder. Lets just hope the stadium is still there Monday. I don't like Jay Cutler, but I can't stand Phil Rivers. The only thing I truly hated about State College was the obnoxious "E-A-G-L-E-S EAGLES" chants while standing in line for Canyon Pizza. You'd be feeling great after a fun night, ans then have to deal with that being screamed in your ear for 10 minutes. This pick is for those assholes. is this a mock-stache post? A quasi-mock post. These are actually how I made my picks, but I tried to throw in some 'stache-isms. Shows how much better Dave is at this. I just ran out and put $5,000 on the Jaguars. I hope you did, 'stache. I hope you did. La-la-la-la-la ----Shut The Hell UP!! !